DENVER  Gov. John Hickenlooper defended his legal crackdown on cities that ban hydraulic fracturing Monday during a debate with a Front Range county commissioner. The debate at Denver Universitys law school was a rare example of an unfriendly reception for the popular governor. Hecklers interrupted him three times. Boulder County Commissioner Elise Jones  his opponent in the debate  lectured him for suing the city of Longmont after voters there opted to ban fracking inside city limits. I gotta tell you, governor. Im new to this public office stuff, but Im pretty sure that suing your constituents isnt a good public outreach strategy, Jones said. More than 96 percent of Colorados natural-gas and oil wells depend on hydraulic fracturing  the injection of high-pressure water, sand and chemicals to break rock formations  Hickenlooper said, so banning fracking is tantamount to banning all drilling. Hickenlooper also fended off questions from the debates moderator, DU professor K.K. DuVivier, who suggested the gas and oil industry has enjoyed a privileged positions under the law compared with renewable-energy firms. The Colorado Oil and Gas Conservation Commission was set up decades ago to prop up the price of oil by making sure drillers didnt extract it all at once and flood the market, DuVivier said. She asked Hickenlooper if the time had come for the government to stop supporting the hydrocarbon industry in favor of renewable energy. The governor said he thinks wind, solar and geothermal power do deserve public subsidies, and he noted that fracking and horizontal drilling technologies were created with billions of dollars in federal assistance. But he defended natural gas as the bridge fuel that will power the country for years while the use of renewable energy grows. Natural gas is good for society, not just private companies, he said. Look at the clean air that were getting out of replacing coal plants with natural-gas plants. ... 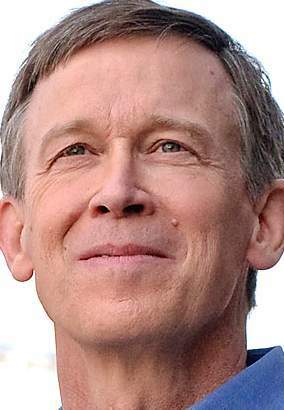 This is a dramatic public good, Hickenlooper said. A bill in the state House would change the COGCCs mission to emphasize environmental protection over the development of natural gas and oil. Hickenlooper did not explicitly say he would veto it if it passes the Legislature, but he did criticize it. Changing the mission of the Colorado Oil and Gas Conservation Commission  thats something you dont do lightly, he said. The exchange briefly touched on the use of water in fracking. Farmers in Boulder County are being outbid for water by energy companies, Jones said, and the industry is risking Colorados agricultural heritage. We need to be a heck of a lot more thoughtful about this, she said. Hickenlooper replied that bluegrass lawns in Denver and Boulder consume more water than the fracking business. A group called Colorado Extraction Resistance invited people on Facebook to Shut Down the Fake Fracking Debate. The group contends that Jones, a former director of the Colorado Environmental Coalition, is also pro-fracking because she does not want to completely ban the process everywhere in Colorado. The hecklers were escorted from the room by police. Its unclear if they were associated with the Colorado Extraction Resistance, but at least one of them targeted both Hickenlooper and Jones. Jones, however, said Colorado towns should be able to decide how to regulate industry inside their city limits. For the state to suggest that we shouldnt play that role is really, really hard for us to swallow, Jones said.